This post is one I’ve been seriously excited to write because I can honestly say that I’ve not discovered another beauty range like this. At all. It’s unique, quirky and fun – exactly the sort of beauty discovery that makes me want to tell you all about it straight away. So for this one, think fairytales. Think long hair, a princess in a tower and the ever sought after Prince Charming too. And you know that saying your mum always has for you when you go through a break up: “You have to kiss a lot of frogs to find your prince”…well, think that too. 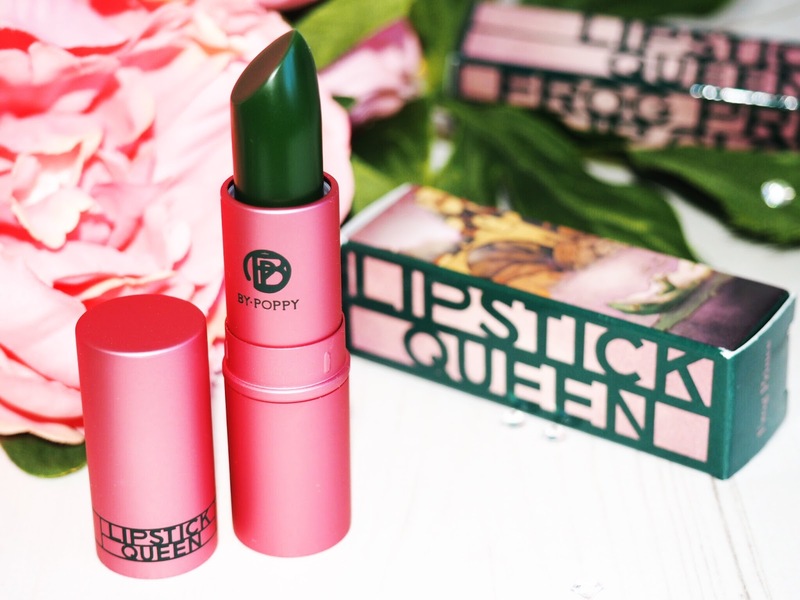 And that’s exactly the sort of vibe you’ll find in the Lipstick Queen Frog Prince Collection. It’s magical and fairytale within a make-up line. Perfect for the hopeless romantics and girlie-girls among us. 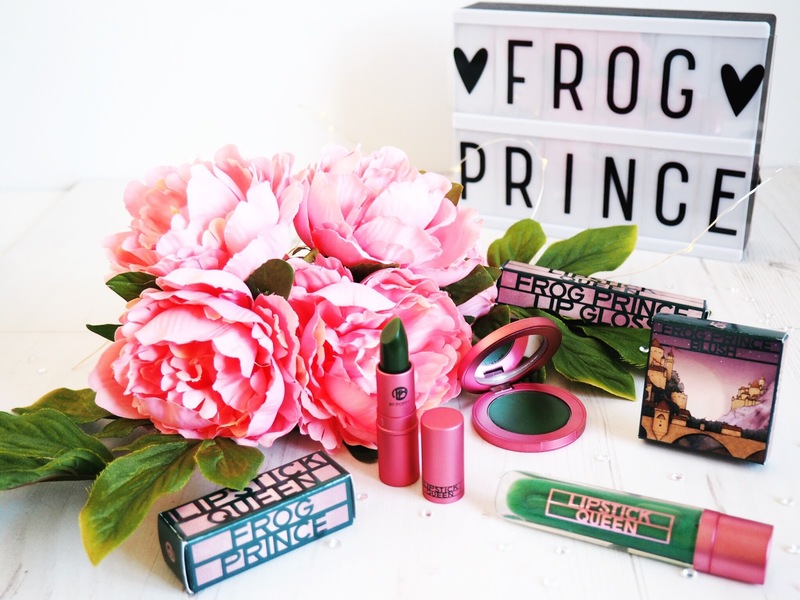 So Lipstick Queen are absolutely bossing it right now with their products, but for me their hero collection is the Frog Prince range. It’s a range that’s…green. Hear me out – because it’s worth it. The Frog Prince collection features a trio of products that are all emerald green. Hence the ‘Frog’ part of the collection name. However there’s magic in the green make-up, because all products have a pH-reacting ingredient that means when worn they transform into your perfect shade of pink. Not only that, but the pink is custom to you because the pH works to match your own natural balance, which means that your lips and cheeks will literally be the perfect shade of pink – custom to your skin tone. How amazing is that?! 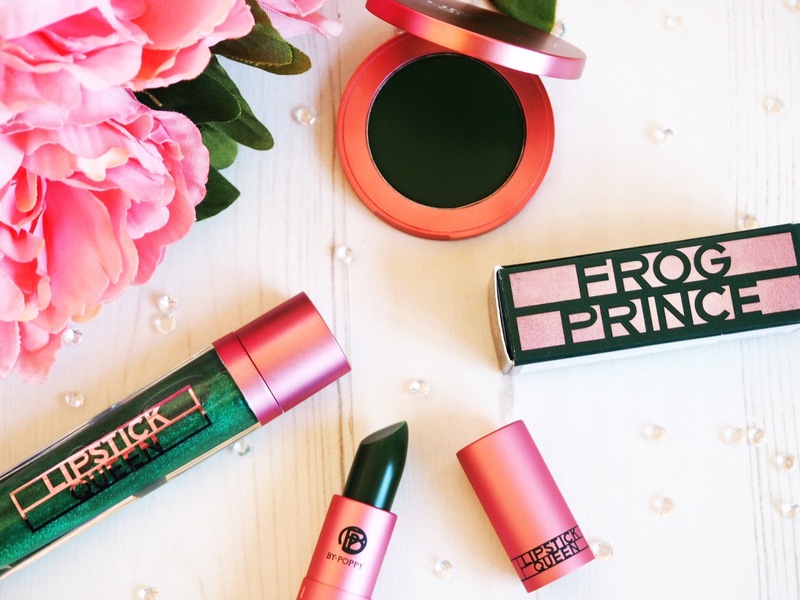 Originally the Frog Prince collection started with the lipstick – and the world went mad. Now the range has been extended with the lipgloss and cream blush too. The original Frog Prince item – and the best introduction to the collection. Emerald green in a bright pink tube, the lipstick glides on like a lip balm. It’s easy to apply and it does feel like you’re applying a balm or butter to your lips when you use it. The vitamin E and Shea Butter within the formula also adds to the nourishing feeling of it being a balm-like lipstick. It goes on clear with a slight hint of green and it’s got a really creamy texture that has an almost glossy finish. It takes about 3-5 minutes to develop into that perfect shade of pink – but it’s worth the wait. You’ll have natural and fairytale princess looking pink lips in no time. I love this because it’s more like your own lips but better…prettier. Because the lipstick works to adapt to my own pH levels, it means that the colour suits me perfectly. Plus I love the wet look finish. It’s really lovely to wear and the colour lasts a good amount of time – the same as any glossy finish lipstick (a few hours before need for reapplication depending on eating/drinking etc) but it’s a pleasure to wear and reapply. 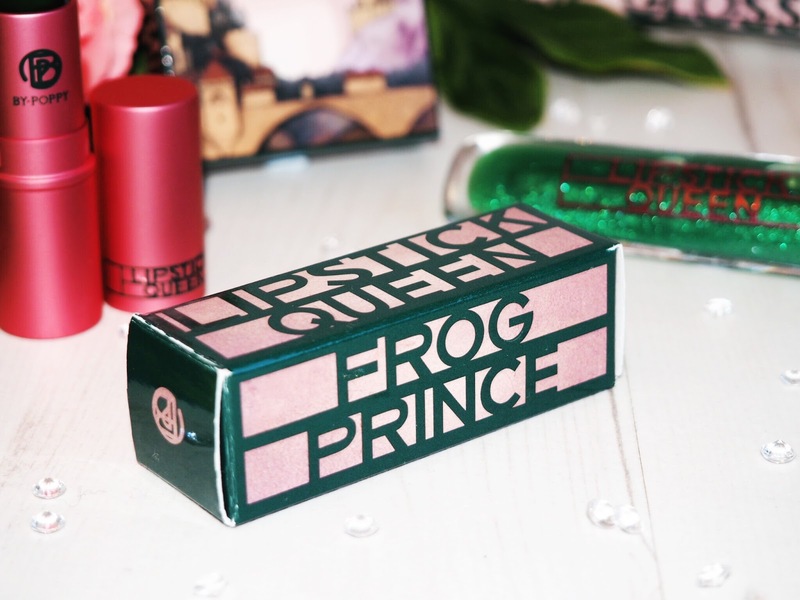 Get the Frog Prince Lipstick here. FYI: don’t worry – none of these products look green when applied! They all go on mostly clear before the colour transformation takes you from green to pink. So you can reapply in the toilets at work without worrying about walking back to your desk with green lips and cheeks! The first of the two new products in the collection – this gloss is seriously a little bit special. It’s the matching shade of emerald green with the addition of green shimmer. It looks daunting to apply but it’s got a beautiful texture and glides on easily. The green is more noticeable in this product than the others because of the shimmer pigments in it. They don’t change colour. But the gloss itself turns that beautiful shade of pink almost as soon as applied. The colour is described as “a romantic rosebud hue” and that’s exactly what it is. It’s got a glossy finish without being sticky – which I love. Nothing worse than sticky lipgloss. 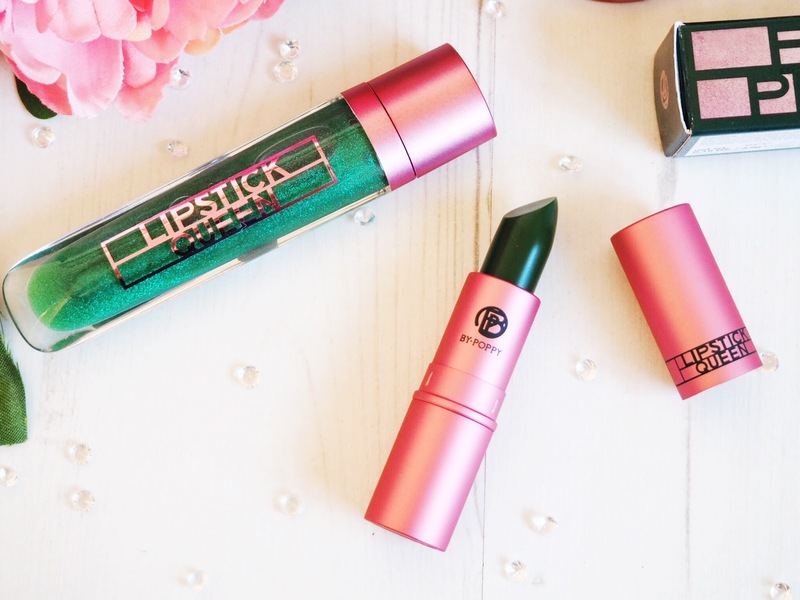 It’s so pretty to wear – and the novelty of applying a green lipstick that goes on pink is never lost on me! 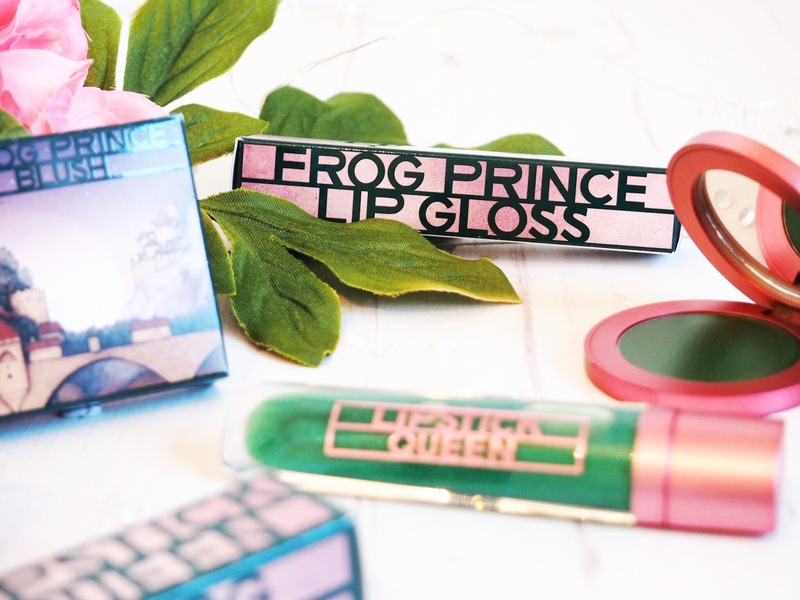 Get the Frog Prince Lipgloss here. The perfect natural pink cheek is achievable with this cream blush. Again – it’s emerald green, so you can be daunted by looking at it! But it changes colour as soon as it comes into contact with your skin, and the pH formula starts to transform almost immediately. My first thoughts about this were about the high quality – it goes on with a creamy gel texture but dries like a glossy cheek stain. The colour is deep and impressive. It’s very buildable and you can stick with one or two light layers for a slight pinched-cheek look, or go all out for more dramatic blush. I apply mine with my fingers but you can apply with a brush if you want to. I’m still getting used to cream blushes overall but this one has no shimmer in it, which is great. 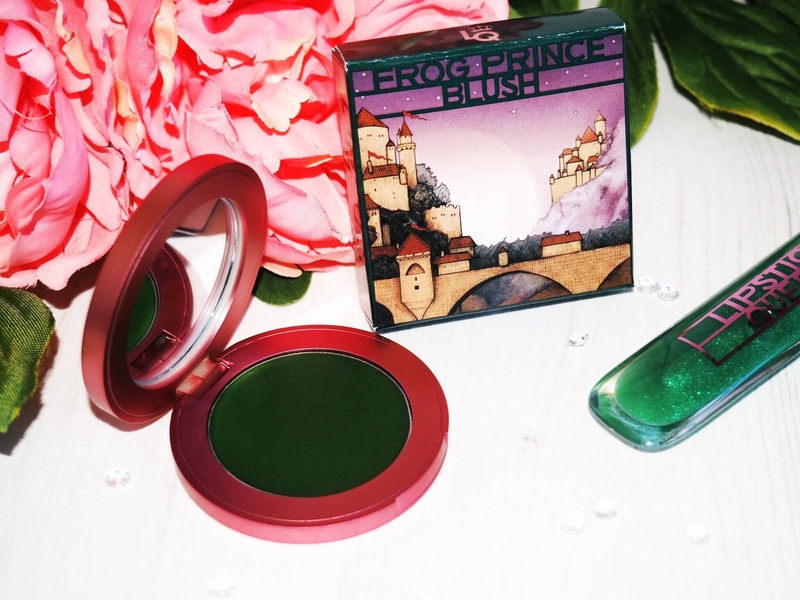 If you love a dewy look, you’ll love the Frog Prince Cream Blush because of the silky cream finish. So. 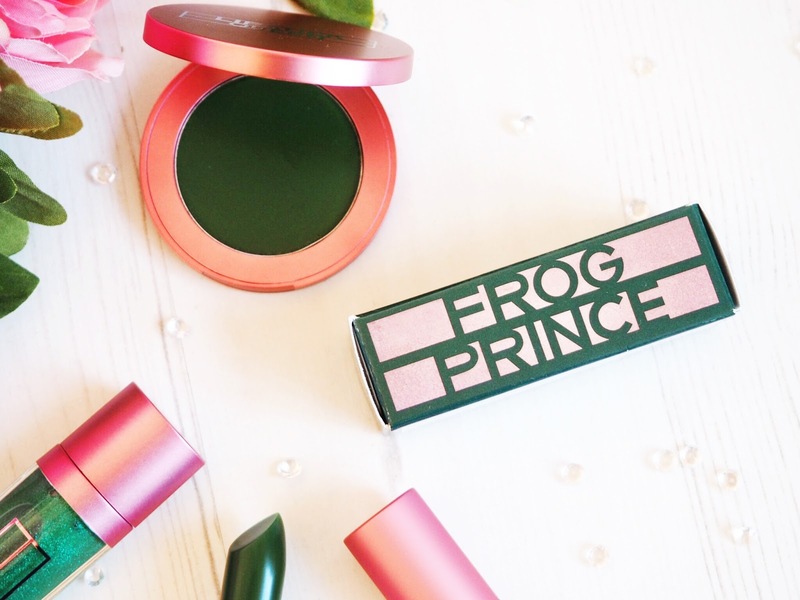 I am head over heels in love with the Frog Prince Collection. The pink finishes that I’m left with from all products are perfect for those natural make-up days, where you just want to add a hint of something that will accentuate your natural features. I think these are great for pale skin tones and summer holiday make-up bags. Plus the novelty of this fairytale style collection is never lost on me – I love the romanticism of it all! I’m a romantic at heart so this collection leaves a lasting impression after each touch from the Frog Prince. 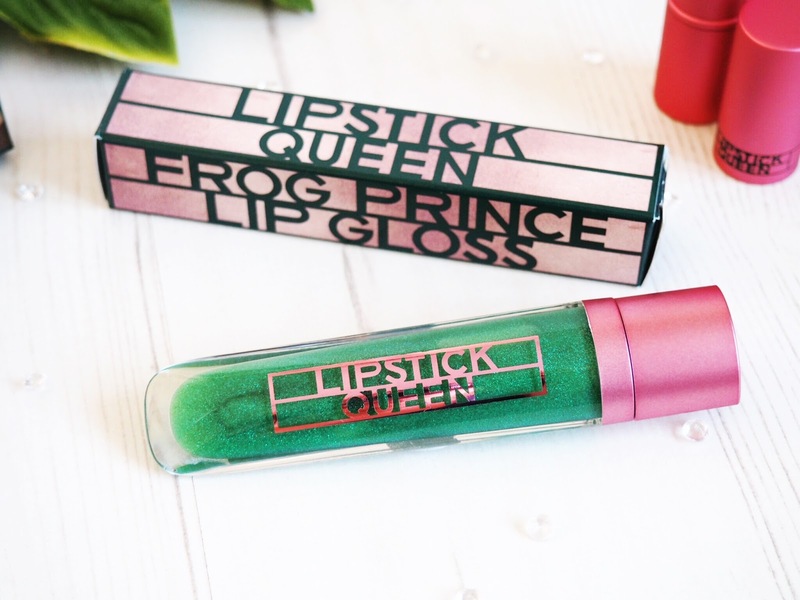 What do you think about the Lipstick Queen Frog Prince Collection?